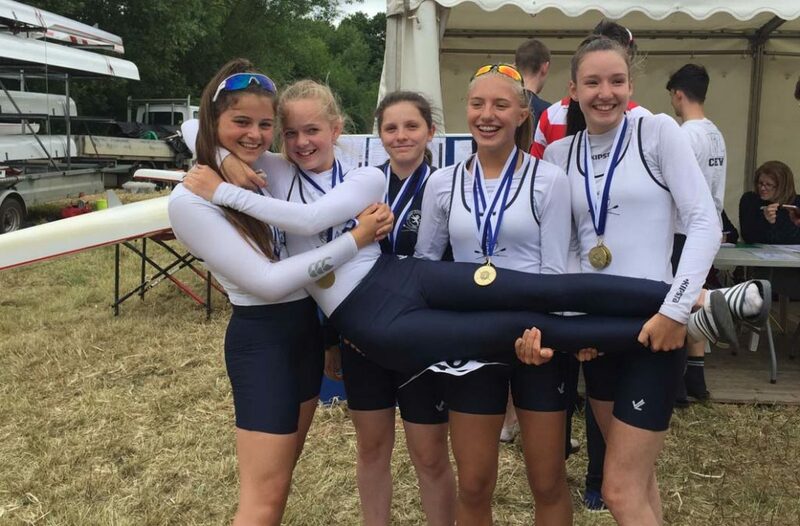 Henley Rowing Club came away with 14 medals from three regattas on 16th and 17th June . Saturday was Marlow Town, Sunday was Reading Regatta and across both days was the British Masters Championships in Nottingham. The competition is banded in average age groups from A average age 27 to K average age 85 and is raced over 1000 metres. Henley Rowing Clubs Women’s Masters Vet E quad of Janet Dutton, Helen Knowles, Margaret, Hall and Julia Lock qualified for the final from a heat raced in blustery conditions which worsened for the final where the ladies finished fourth. 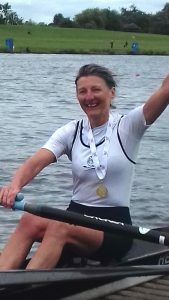 Earlier in the day Janet Dutton had a comfortable victory in her single to win gold in the Women’s Vet F single sculls. 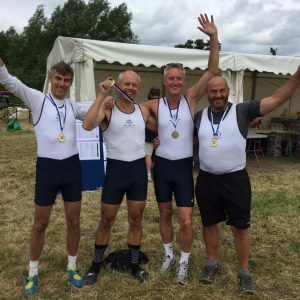 Vet D/E quad of Mike Hornsby, Sean Paice, Rob Berrington and Jeff Ellison had a convincing win in a straight final over two crews from the local club Marlow. Penny Hamand competing in both Women’s Masters A/B single and Women’s Singles won both her events beating separate scullers from Falcon RC in each final. The Junior Boys squad came home with 5 wins from the 7 events in which they competed. Cameron Seager who having won at Weybridge last week raced convincingly to win the J15 single event, this was followed by an all Henley final in the J16 doubles with James Wallace and Sam Beattie just holding off Ethan Chatfield and Alex Carr in a close race. The open (senior event) doubles was won comfortably by John Yolland and Ollie Taylor who were too strong for the crew from Great Marlow School. The J16 quad final was a tussle between Henley and old rivals Windsor Boys School resulting in a win for Henley who showed good technique from the crew of Ethan Chatfield, Soran O’Connor ( a J15), Charlie Garnham and Alex Carr. In the open quad event John Yolland, Ollie Taylor, James Wallace and Sam Beattie took the honours by beating Wallingford comfortably, so all of the boys that entered this regatta went home with a medal. Not to be out done the Henley J14 girls won all their events. 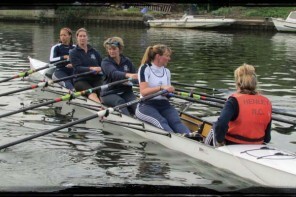 The first division saw the girls racing in two quads where they overcame all competition to make it an all Henley final. 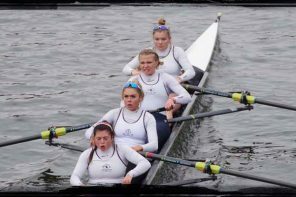 The crew of Natalie Schoenmakers, Laoise O’Donohue,Josie Sawbridge, Bea Bethell and cox Daisy Rolstone, overcame their team mates Charlotte Beadmore,Mia Roullier,Ella McKay and Molly Collings to win by 6 secs. The second division saw the two quads combined to race in the octuple scull, where in the heats and final they beat crews from Upper Latimer School by a convincing 3 lengths. The third division saw two of the three Henley doubles making the final, with the O’Donohue/McKay double winning, Ross Rowing Club second, and the Schoenmakers/Beadmore coming third by a canvas. 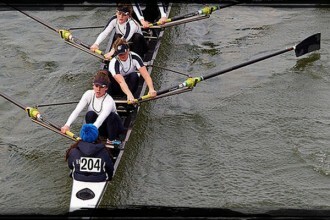 On Sunday the J14s and J13s attended Reading Regatta. 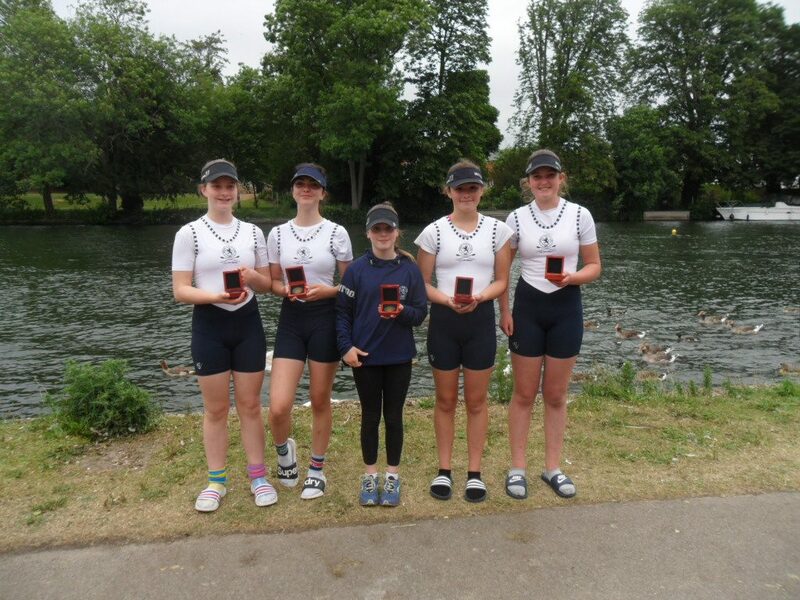 The J14 girls after winning two rounds a piece, again met each other in the final with the crew of Natalie Schoenmakers, Laoise O’Donohue, Mia Roullier Josie Sawbridge and cox Daisy Rolstone winning by 2 1/2 lengths. The Henley J13 Boys raced against crews from The Langley Academy and LVS Ascot and reached the final but unfortunately lost to Langley in the final by three lengths. The girls double of Eleanor Taylor and Eyla Wild were unfortunately beaten Reading double. The two J13 girls quads were successful in beating crews from Surbiton High School, LVS Ascot, and City of Oxford to end up with another all Henley final. The crew of Sophie Graham, Gabby Chaplin, Lucy Jones, Ailish Harkin and cox Francesca Whittle beating the second crew of Yasmin Laktos, Hannah Boddy, Georgia Catlin, Anya Marston and cox Sophie Habershon by two lengths.